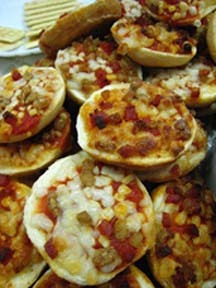 Homemade pizza bagels are perfect for a quick lunch or after school snack. They’re a great make ahead recipe that’s ready in no time. Lunch in 10 minutes? I’m usually not willing to spend longer than that on lunch prep anyway. For a meal the regular bagels are a good serving size where as the mini bagels are a lot more fun to eat and ideal for snacking. 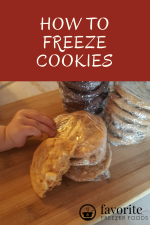 Another reason I love this recipe is because it’s kid friendly, both to make and to eat. Have an adult slice the bagels and the kids can do the rest. Up to ¾ cup topping of choice, sausage, pepperoni, olives, peppers, ham, pineapple, feta etc. Work over a cookie sheet lined with tin foil or parchment paper for easy clean up. And choose, if possible, bagels without a large whole in the middle. It’s not necessary but makes spreading sauce and toppings much faster. Cut bagels in half and spread with 1-2 tablespoons of sauce depending how thick you prefer it. Many people toast the bagels and you can if you choose. I, however, don’t bother because I don’t find it necessary. Why add a step and spend even more time in the kitchen? Homemade sauce is the best but on occasion I’ve used canned. When using canned I like to sprinkle dried chopped basil and oregano over the sauce for extra flavor. Cook toppings before adding them unless you are using veggies and want a crunch. Meat doesn’t have enough time to cook from raw on these so it must be precooked. Usually I’m a firm believed in toppings on top, like pepperoni on top of the cheese. But with the smaller bagels I’ve had problems with the toppings rolling off. Thus I put the topping over the sauce and cheese on top. Pizza bagels can be frozen before or after cooking. Precook if your going to pack them for lunches, that way they are cooked already and can thaw between packing in the morning and lunchtime. The other benefit to precooking is that the toppings are secure. Unbaked they tend to lose pieces of cheese or topping that freeze but don’t freeze to the sauce. 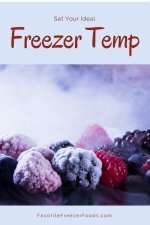 Either way freeze on cookie sheets without touching for 3 hours or until frozen solid. Then repackage in freezer bags and store for 2-3 months. Bake pizza bagels at 375 for 10-12 minutes until the cheese melts in a preheated oven or toaster oven. Again, line your pan with parchment paper or tin foil for easy clean up. Frozen pizza bagels don't take much longer to heat than fresh made, unfrozen bagels. There is no need to thaw unless you want to. In my experience the microwave leaves the mini bagels more flexible and harder to hold. Besides the ovens give a crispier, better result. But if your in a hurry it’s better than the drive thru. How Can I Make These Healthier? Return from Pizza Bagels to the homepage of Favorite Freezer Foods.